PHOENIX — A.J. Pollock said he knew one at-bat into his minor league rehab assignment that he was ready to return to the Diamondbacks. He joked he thought about texting manager Torey Lovullo as much — before taking another at-bat or playing the field. Steven Souza Jr., also on a rehab assignment with Triple-A Reno brought up the at-bat as well, unprompted. “The ball must have exploded off his bat because it was such a special, special result,” Lovullo said to laughter. It was line out to the right fielder. But everyone viewed it a good sign. 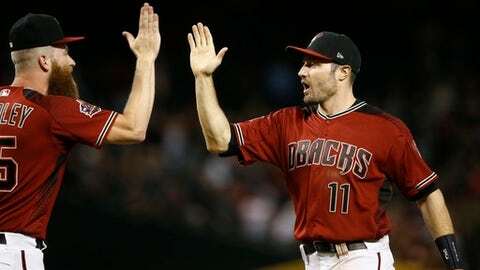 So after two games with Reno, Pollock was back in the cleanup sport for the D-backs on Monday as they opened a three-game series against the Cardinals. Some of that feedback, according to Lovullo, was a text message some six inches long after Pollock’s second game — in which he went 3 for 3 with a double and home runs. “I called him a couple days ago because I had a text message that long,” Lovullo said, demonstrating with his fingers, “saying, ‘I’m ready and here are the reasons why.’ … At that point I’d basically made up my mind. Pollock fractured his left thumb diving for a fly ball on May 14 and missed 44 games. “My thumb has been good for weeks now, so that’s not even a concern of mine. It was about getting my legs under me,” Pollock said. “Everything has been feeling great for a long time. I knew it wasn’t going to take a lot to feel like I’m ready to go out there and compete at the big-league level. I’m thankful that the guys here trusted me. Pollock was hitting .293/.340/.620 with 11 home runs and 33 RBI before he was injured. He was the NL Player of the Month for April/May and on pace for the best season of his career. The D-backs were 23-20 without their center fielder. There still is time for him to accomplish that, but at least at first Lovullo and the D-backs will ease him back into playing every day.